Most, if not everyone, has a bucket list of places they want to go or things they want to do. 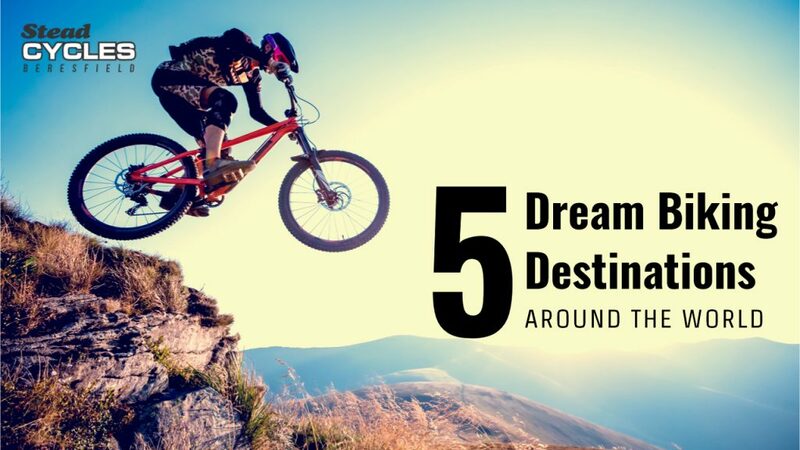 Biking enthusiasts sure have their own bucket list too! After passing each trail’s challenges and getting used to them, isn’t it about time you experience the most breathtaking biking adventures ever? Here are some picks for your biking bucket list. Nothing stops you from picking all of them, too. One of the world’s most popular biking destinations is just a plane ride across the Tasman Sea. A biker’s paradise, New Zealand offers multiple cycling trails with unspoiled natural scenery as backdrop. In fact, the government and biking groups have teamed up to build a network of cycling trails through the country. For those who want a mix of cross-country and down-hilling, with a combination of lush green mountains and rugged terrain, Queenstown and Wanaka in the South Island is your go-to. If you happen to be a Lord of the Rings fan, this is your place, too, as scenes from the film trilogy were shot here. A popular trail in the area is the Queenstown Trail. Though it has been used for a long time, construction work was done on the approximately 120-kilometre trail leading to its’ formal opening as a part of the New Zealand Cycle Trail system in 2012. Many parts of the trail follow the terrain passing along the sides of rivers and lakes. Bikers at any level, whether easy, intermediate, or advanced, can traverse parts of the trail, depending on the particular section. Check the map of the Queenstown Trail here. If you want a mix of inland forest and shoreline track, then try the area around Lake Taupo in the North Island. For the complete Taupo biking experience, go for the Great Lake Trail. 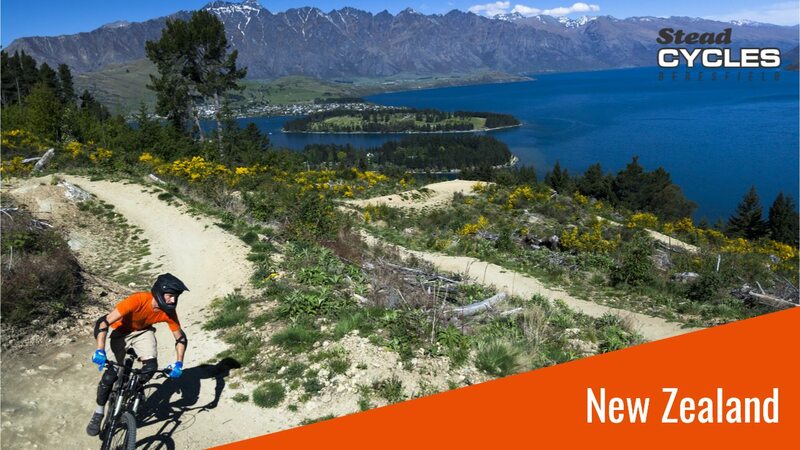 Also a part of the New Zealand Cycle Trail system, the trail offers a backdrop of native forests, waterfalls, beaches, and panoramic views of the country’s largest lake. Depending on what track you take, you’ll be able to complete around 52 to 71 kilometres of the trail in 2 days. 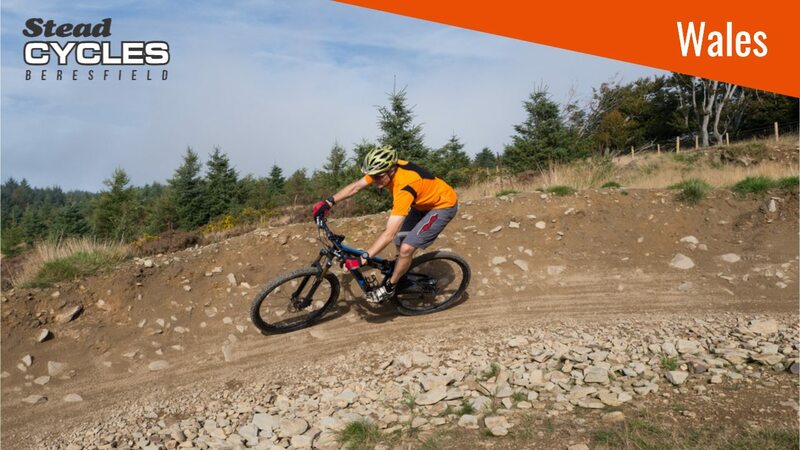 The trail has a Grade 3 ride, meaning that while bikers of all levels can take it on, it’s recommended for those at least at the intermediate level. Check out the Great Lake Trail map here. If you’re not ready yet, don’t worry. Taupo still has other trails to offer to rev up your biking skills and experience. The Timber Trail inside the Pureora Forest Park runs along old logging roads and tramlines. In fact, you can see along the 87-kilometre trail an abandoned timber-miller’s tractor covered by ancient trees. With the adventure heading deep into the remote wilderness, plus a limited access, the journey lasts 2 days. This trail is suitable for all levels. For a detailed map, click here. If this still doesn’t suit you, there’s still another one. The Craters Mountain Bike Park is definitely fit for beginners, sporting a 55-kilometre single track. Since this mountain bike park is downhill, expect a fast ride lasting from 1-8 hours, depending on your biking level. Feeling a bit more adventurous? Then grab your gear and head to the Vancouver area. The suburbs of this Pacific coast city are not only known for their ski resorts (they actually hosted the 2010 Winter Olympics), but also for great MTB trails. You may have heard about biking “North Shore style”. This originated from the trails on the mountainous coasts north of Vancouver, which have elevated trails made of interconnecting bridges and logs. The North Shore’s main MTB areas are Mt. Fromme and Mt. Seymour. Well-known trails include the CBC, Pipeline, and Old Buck. Many of the trails on the North Shore are for intermediate bikers and up. Find out here what trail fits you. 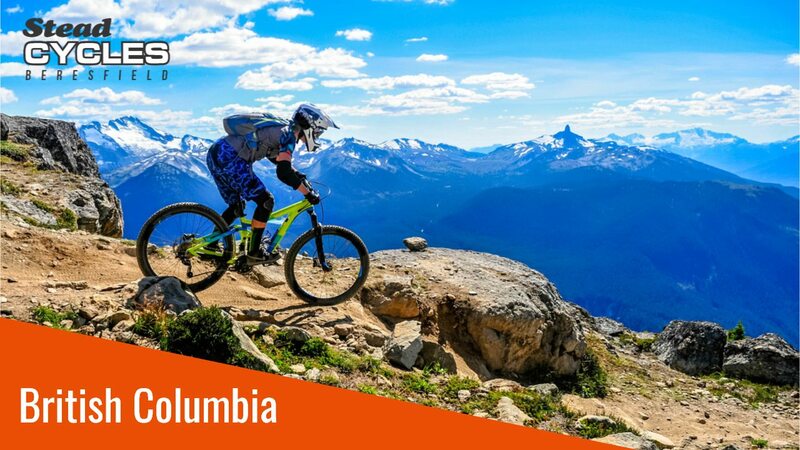 While Whistler is popular for skiing, it also boasts a mountain bike park that is considered the top lift-accessed downhill bike park in the world. The Whistler Mountain Bike Park is made up of 5 biking zones suited to different tastes and adventure levels. From the classic downhill ride of the Fitzsimmons Zone (suitable for all levels) to the top-of-the-world biking experience of the Peak Zone, Whistler has you covered. Located on Italy’s Mediterranean coast near France, Finale Ligure offers bikers not just with a variation of downhill rides, but also a spectacular view of the sea. All types of single-track terrain from sharp, jagged rocks to smooth, winding forests can be found in the area. You’ll be amazed to learn that locals have been building the trails for over 30 years and have attracted countless bikers from all over the globe. What better way to cap off the adventure with a drink or two in the old town or by the beach while enjoying the sea you saw while biking. Check more on this site if you’re planning on a biking vacation in Finale Ligure. Antur ‘Stiniog boasts of 7 trails graded from blue (moderate) to black (severe) that have received international acclaim. If you’re relatively new to biking, try the blue-graded Jympar trail, the easiest and latest of Antur ‘Stiniog’s offerings. It’s less steep compared to the rest of the trails, but still has features that interest veteran downhillers. For the hard-core downhiller, the black-graded trails won’t fail to satisfy your biking adventure craving. Expect big rock sections and jumps on the Black Powder trail, while lots of twists and turns await you at the Bendy-G trail. But wait, there’s more! Antur ‘Stiniog also has a double black-grade trail – the Y Du trail. It’s not just a combination of the Black Powder and Bendy-G, but also ramps up the adventure in your ride. Expect a much faster ride, big jumps (due to steep rocks), and more carved turns. Just make sure you’re prepared and experienced enough to take on this course. Check out more here about Antur ‘Stiniog, which is proud to have Britain’s best mountain bike uplift service. Our northern neighbour offers a dream biking experience, especially if you’re looking to experience the tropics. In Bali, try going through the Jatiluwih rice fields (UNESCO World Heritage site), then go around the crater of Mount Batur, followed by a 30-kilometre downhill course leading to the island’s southeast coast. The ride covers a total distance of nearly 150 kilometres and can be completed in 3 days. In Java you can ride around the crater of Mount Bromo on the eastern section of the Island. This 132-kilometre ride is unique because of the loose sand around the crater. There’s a bit of a catch, however, as you’ll have to carry your bike for some few hundred steps before reaching the crater. While the ride is mostly downhill, there are climbs on some parts of the trail. Learn more about biking in Indonesia, as well as biking tour packages here. Shop for a bike in Newcastle today! Whatever you choose as part of your biking bucket list, bring along a Newcastle bike with you. Get yours now here at Stead Cycles!